Environmentally friendly products are the rage today, and Green Herc is taking a leading role in the movement with its plastic grocery T-shirt bags. Made with high-density polyethylene plastic, the bags also contain an algae-based additive that makes the plastic recognizable as a food to microbes. 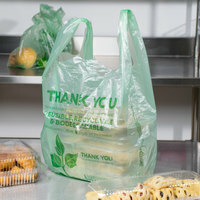 The additive attracts the microbes to the bags, which then assist in decomposition and allows them to fully break-down faster than other biodegradable bags. Green Herc plastic grocery T-shirt bags are both tough and durable, so they won't fall apart while customers carry their heavy items. The best part is they’re completely biodegradable, reusable, and recyclable, so your business can clearly display its eco-friendly side. Want more eco-conscious products? Check out our line of green, biodegradable cup carrier trays, our green, biodegradable plastic flatware, and our green, biodegradable straws. If you're wondering where to buy green herc plastic grocery / t-shirt bags, we have a large selection of green herc plastic grocery / t-shirt bags for sale at the lowest prices.